How can you not love Diego Rivera? 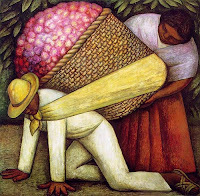 This one - The Flower Carrier, 1935 - is here in SF at the MoMA. Rivera also left a number of enormous murals throughout the city, notably in the inside of the top of Coit Tower, and also at the Diego Rivera Theater over at City College. The scope of his work is incredible in person. And this one is one of my favorites, not just because of the hydrangeas, but because of the color palette, the strength, the warmth, and the unspoken sympathy for workers' rights.